All photographs have the opportunity to be awarded the awards and trophies as listed below. There is a Champion photograph selected from each of the six categories. Winners of these also receive sponsor prizes. There are also Honours awards from each category selected and the recipients will also receive prizes from the sponsors. This trophy is a painting by Lois K Cook of Mt D’Archiac donated (in 1969) by friends of the late John Harrison who was killed in an avalanche during the Mt Rolleston rescue attempt 23 June 1966. 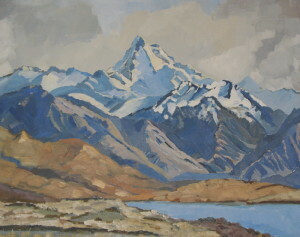 This painting was missing for some time but was rediscovered hanging at Unwin Lodge at Mount Cook. It was brought back to Christchurch in 2009 and now hangs in the National Office Reference Library. The trophy is awarded for the overall champion photograph, irrespective of category. Initially, this award was for the ‘champion monochrome print’, but colour is now included in the judging. In 2014 Peter Garrett, on behalf of Alpine Risk Management, kindly donated a replacement cup for this award. The cup is awarded for the most outstanding photograph of mountaineering, not purely depicting alpine scenery hence why it is open to entries from multiple categories (as judged by a mountaineer). In 1980 Wally Dorflinger (1918-1998), who was a keen photographer of alpine flowers, donated a wooden carving of the native New Zealand flower of the (Dactylanthus Taylorii), or Wood Rose as it is commonly called. The ‘Natural History Trophy’ was the intended title of this award, but the committee voted this idea and instead went with the ‘Dorflinger Trophy’. This trophy’s whereabouts has been unknown for many years, therefore the award was replaced by the Erica Beuzenberg Memorial Award in 2009. 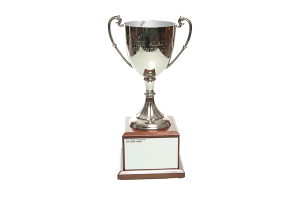 (No image is available for the Dorflinger Trophy). Kindly donated by NZAC members Paul Corwin and Sally Widdowson for the 2009 Photographic Competition. 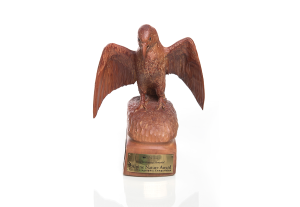 This award is of the New Zealand native parrot (Nestor notabilis), or Kea as it is commonly called. Carved in wood (Photinia), with wings outstretched. The carving was created by local sculptor Andrew Lyons from Christchurch, New Zealand. Erica Beuzenberg was a well-known New Zealand climber and guide who was tragically killed on Ball Pass, in the Southern Alps of New Zealand on 3 March 2005. This award is for the most outstanding Alpine Nature photograph. For the 2009 competition, a new Youth category was created in memory of Gottlieb Braun-Elwert. The prize for this category is a Ball Pass Crossing (or credit to the same value towards an Alpine Recreation climbing course). This is donated by Gottlieb’s family, who continue to run the Alpine Recreation guiding company. Also known as the “Syme Trophy” after Rod Syme the person who donated it in about 1985/6 and who was most associated with these two peaks. It originally depicted the two mountains etched on a metal plate attached to a timber plaque. The trophy went missing in the late 1990’s and when it was rediscovered in 2009, some metal plating was missing and no pictures could be found showing how it originally looked. The remaining plated aluminium was found to be poorly cut and engraved. In time for the July 2009 Photo Competition, local artist, Corey Koppe, recreated the award with all new graphics on gold dyed anacoil aluminium. An updated Section winners list engraved in this metal shows through as raised silver. The trophy will now remain on display in the Club’s National Office Reference Library, Christchurch. Awarded as the inter-section competition prize, to the section with the most winner points.